16/37! That is sixteen days since I last saw the familiar faces of friends, when Denise, Jan and Wolfgang waved me off at the train station in Bad Schandau, Germany, and I have another thirty-seven days of travelling before I see familiar faces again, when I meet Monica and Linley in Paris! I’ve been concerned that my trip is racing along at a rapid speed of knots and constantly live in fear of running out of time! But deciding to measure the trip in this way I have immediately given myself a better perspective and perhaps won’t feel so desperately driven! It seems such a long time ago now since I set out on that scary first train journey to Prague. I always maintain that when tackling something new, the first step is always the hardest and once you overcome that, the “new” becomes the familiar. 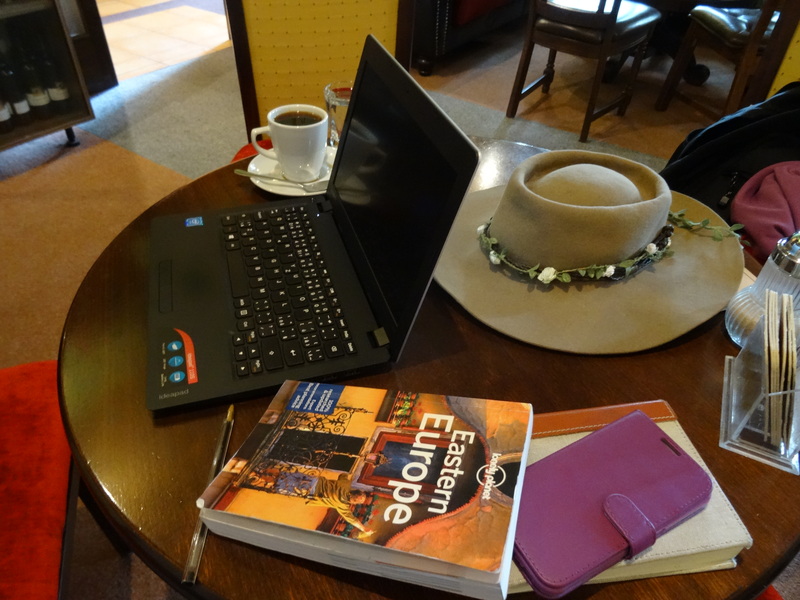 True of this trip, apart from my frustrations of trying to get out of Prague train station to go to Kutna Hora, nothing has seemed quite as difficult or challenging as that first train journey. So I thought I’d pause for a moment and reflect upon how I am with my journey so far……. Life on the road and living in hostels certainly has a different flavour to mainstream living to say the least! In the beginning I found the emotional impact to be quite unnerving at times, suddenly deprived of home comforts and private space I often had to remind myself to simply live in and trust the moment…….to just relax and go with the flow. It feels as if everything that I am has been stripped right back to my very core and I am at the bottom two rungs of “Maslow’s Hierarchy of Needs”; where all that is really important to me is food, water, warmth and rest, with a fair bit of safety and security thrown in. Of course it isn’t entirely about survival and I still enjoy a glass of wine or a cup of coffee in pleasant surroundings as I watch the world go by, but in essence, my needs have become basic and my pleasures simple. The meagre contents of my backpack and daypack are my life but I still think I have too much!! When I am on the move they are heavy and cumbersome and despite using everything I have I still keep considering what else I could do without! Each new bunk bed immediately becomes “home” and I have routines, simple as they are, that keep my life in order. I have a place for everything and everything must be in its place, not just within the packs, but in and around my bed too! It helps to keep everything together and hopefully minimises the chances of losing or having something stolen. I find it also keeps my mind uncluttered and clear to focus on the important things. Sharing with other people has also become easier. Initially I was extremely conscious of being so much older than everyone else, of needing my own personal space and privacy to carry out my ablutions etc., but I’ve been fortunate enough to have pleasant dorm mates, and if not necessarily chatty, at least friendly and mutually respectful. Mixed dorm sharing certainly was a comfort zone tester in the beginning, but I quickly realised that regardless of gender, age, language or ethnic background, we all have one thing in common and that is our passion for travelling, which makes us all equal in each other’s eyes. As we go about our personal business we seem to have an unspoken code that we don’t see or hear anything relating to the other persons personal space and we constantly show consideration for others. I’ve only had one exception to this so far and I am grateful that it was well into my trip before I had to tolerate a noisy and obnoxious couple coming back to the dorm drunk in the early hours of the morning, disturbing everyone in their wake! They shared a bed right next to mine and when I awoke in the morning and opened my eyes I was immediately confronted with the sight of male nether regions exposed for all to see! I’m no prude, but I could have done without that sight first thing in the morning!! I dare say I will have other less pleasant experiences along the way, but at least I know that on balance people are respectful and decent. The alternative of course is to pay for private rooms, but my funds would not cope with that. I’ve decided anyway that I like the community and companionship of hostels, even if people don’t always talk a lot, but at least I am amongst like- minded people. Talking of which, I am disappointed that our obsession with social media and our smartphones, iPads etc. has had such an adverse affect on our desire or ability to communicate with people around us. In my old days of backpacking, hostels were the hub of communication and a brilliant source for meeting new people. 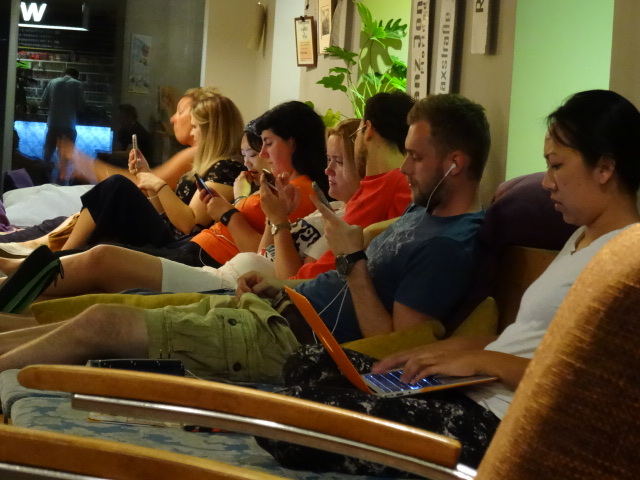 Now one can sit in a common room full of people, no one making eye contact or talking; everyone with eyes down, focused on something on the internet. Of course this habit is self-perpetuating and even I, deprived of anyone to talk to, do exactly the same thing! Needless to say life in this case, revolves around having Wi-Fi access and power sockets! 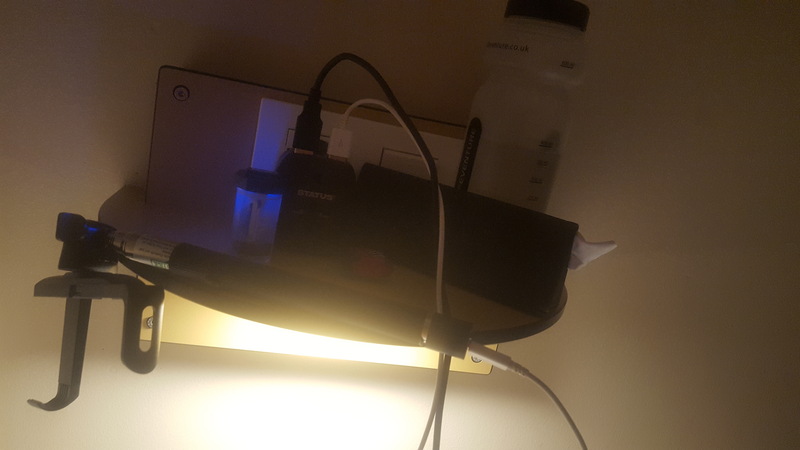 I was particularly excited with one “new home”, when I found that my bunk bed not only had its own bedside light but it had a double power socket and a little shelf!! These are the kind of simple little things that bring me pleasure. Between the lack of talking in hostels and difficulties with language barriers I do spend a lot of time alone without experiencing anything more than basic conversations with people, but I am ok with that. Somehow I have come to be at peace with my own company and if I do get too lonely or homesick I ask myself what am I pining for? Since all the changes and losses in my life have occurred, my home isn’t really a place of roots any more, and I remind myself that I am on an exceptional journey, one that not too many people ever get the opportunity to take. I am free to go where I want and be who I want and besides, because of the wonders of internet I am only a free call away from friends and family anyway! However I do still find myself walking along a lovely path surrounded by beautiful scenery, green trees, birds chirping, sun shining, happy one minute and weeping silently the next. I realise it’s all par for the course of grieving and much as I get frustrated with myself I need to just let things be. Albeit I have come to realise I am more susceptible to weeping when I am overtired and I need to recognise that sometimes it is ok just to take a day out to simply rest and recharge. I’d thought about buying one of those Fitness Trackers before I started my trip and decided I couldn’t afford the expense, but I wish now that I had as I would really like to know how much distance I have walked already. I walk everywhere and often for as long as five or six hours at a time, or longer, only stopping for a refreshment at a café or rest on a park bench along the way. I pound the pavements day after day as I explore new places, and new places means a new map and a new set of bearings to master. It’s little wonder I get tired and weepy like an exhausted child that won’t give in! But I am beginning to feel the health benefits as I am undoubtedly getting fitter; leg muscles strong and defined, skin tanned and smooth and lots of fresh air ensuring I sleep deeply and restfully. It is quite difficult however to strike a good balance between exploring and simply experiencing. In the beginning I felt compelled to be a tourist, frantically ticking off the things to see and do. But I found I was quickly reaching burnout and wasn’t experiencing the things that makes a trip special; the unique meeting of people and brushes with cultures. Throw into the mix the need to find time to write my blog posts and things were getting just a little bit stressful! I’ve realised however that I simply need to slow down and just be still sometimes and allow experiences to naturally transpire! I still don’t have the mix quite right yet but I am trying. So all in all, Dear Diary, life on the road so far has been a journey of letting go and adapting to the rhythm of the road. I don’t think I’ve fully embraced it yet and I still need to be more intuitive to letting the path ahead open up naturally, but I am working on it and am content with my progress so far. ← Karlovy Vary And The Spout Cup Trail!